Regular piggy banks are fine if you enjoy wasting your time slowly inserting one coin at a time through the slot. The faster solution is this cool new COINK Piggy Bank. 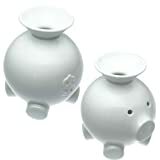 This stylish and unique ceramic piggy bank lets you quickly empty your coin-filled pockets through a convenient funnel on it's back. It also makes it much easier to make a withdrawal when it's time to buy more bacon.